James H. Shelton III has been formally confirmed as deputy secretary of education for the United States Department of Education. 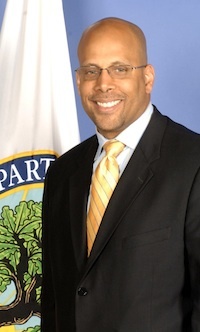 Shelton was previously assistant deputy secretary of education in the Office of Innovation and Improvement within ED. Before joining the department, he was a director at the Bill & Melinda Gates Foundation and has been involved with the business side of education technology at the NewSchools Venture Fund and education management company LearnNow. In a statement commemorating the confirmation, Education Secretary Arne Duncan said: "Jim Shelton has dedicated his life to finding new and better ways to level the playing field for every student—no matter his or her zip code. He's a champion for children, and a trusted partner and friend. I'm thrilled he's been confirmed as a key member of the Department's leadership team." The formal confirmation occurred yesterday by voice vote in the U.S. Senate.